Good morning, Friends! Happy Easter! On Easter Sunday, I don’t like to give a long message. Mostly, we celebrate. We sing a lot. We rejoice. Re-joice. Back when I was taking English class in school, they would call that a compound word. Any time you put RE at the beginning of a word, that means you do it again. Re-do means do it over. Re-pair means you put the pieces back together again. Re-negotiate means you go back to the beginning and make a fresh and fair new agreement. Re-joice means to put the joy back in our lives. So much of the time we’re scared. We’re angry, we’re frustrated and aggravated about things. We forget about God. We forget about peace. We forget about joy. So, re-joice means to get the joy back. It means to get with the joy again. It means to re-learn the whole reason for joy, the reason for being Christians. In their fright the women bowed down with their faces to the ground, but the men said to them, “Why do you look for the living among the dead? He is not here; he has risen! Remember how he told you, while he was still with you in Galilee: ‘The Son of Man must be delivered over to the hands of sinners, be crucified and on the third day be raised again.’ ” Then they remembered his words. But they did not believe the women, because their words seemed to them like nonsense. Peter, however, got up and ran to the tomb. Bending over, he saw the strips of linen lying by themselves, and he went away, wondering to himself what had happened. Easter is about so many things. It’s like we put all the songs, and all the traditions, and all the different things which millions of people believe about Jesus, and we roll them all up into a great big wad, and we call it all Easter. Easter is unbelievable. Do you know what’s the difference between a Northern fairy tale and a Southern fairy tale? This is something I’ve actually had to learn this year. At dawn on Easter morning, people were afraid. They knew that Jesus was dead. They had watched his execution themselves. Their Lord was dead, and they knew that they might be next. Being a friend of Jesus was not a very safe thing right then. They were keeping their heads down. Then you get this crazy story about angels and an empty tomb. Who’d believe that? But Peter had the curiosity to get up and go and see for himself. And the women were right. The tomb was empty. Jesus wasn’t out there in the graveyard. He was gone! Christianity is basically the discovery that Christ isn’t dead, after all. Christ is alive! Christ is stronger, wiser, more powerful, more joyful, more forgiving, more everything than he ever was, even on the pages of the Bible. Christ is alive! People met the risen Christ in all sorts of places. They met him walking right beside them on the road. He came to them in places they were hiding. They met him on the beach, when they came in from fishing. They met him in prison cells. They met him on sick beds. They met him at the supper table and in the work place. I am not making this up, by the way. These are all places where the gospel records that people actually met the risen Christ. The only place people did not find Jesus was dead and buried, in the grave. The short version of Easter, the text version, is “Tomb = empty. Have u met him yet?” That message went viral, throughout the community of people who had known Jesus. That is the authentic Christian message. That is what Easter is all about. It’s about discovery! It’s about wonder. It’s about joy. It’s about getting our joy back. It’s about joy in the face of death. Easter isn’t about denying death, or pretending that death isn’t there. Easter is saying that Christ is alive, that death doesn’t have the last word. Easter is about impossible life, unbelievable faith, joy beyond expectation. It’s about the defeat of death, the defeat of all the powers of evil and violence and destruction we see in the world today. Easter means that the place of death is empty. The cross – the instrument of terrible death – is transformed. Jesus isn’t there on the cross any more. It’s growing flowers instead. Where is Jesus now? He’s out there, somewhere. He’s gone on ahead of us. You’ll meet him. He’s in here, in our hearts. He’s beside us. Expect to be surprised! Expect to be amazed! Expect to be undone by his love and life and peace and blessing and mercy! I hope you all will come back next week. I hope you’ll try to come here as often as you can. Because this is what it’s about. 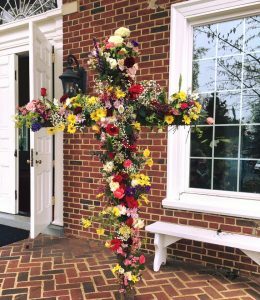 We may not do the Flowering Cross every Sunday. Maybe we should. It’s such a powerful symbol of what our faith is all about. We tell each other where we’re hurting. We pray for each other. We try to lift each other up, and share each others’ burdens. We help wherever we can. Everyone here is a minister. We talk about the love of God, and we’re honest about how hard it is sometimes to be a Christian. But mostly, we talk about joy. We talk about life. We talk about hope and faith. And we try to have fun. We laugh a lot! We laugh at ourselves, and we laugh at how ridiculous it all is some days. Sometimes we laugh to keep from crying, but most of the time we laugh because of joy. Christ is not dead. The tomb is empty. We’re still finding him, every day. It’s all about joy.